We know that juice can be cold pressed and is very popular these days. But its not just juice that can be cold pressed, beauty products can as well. 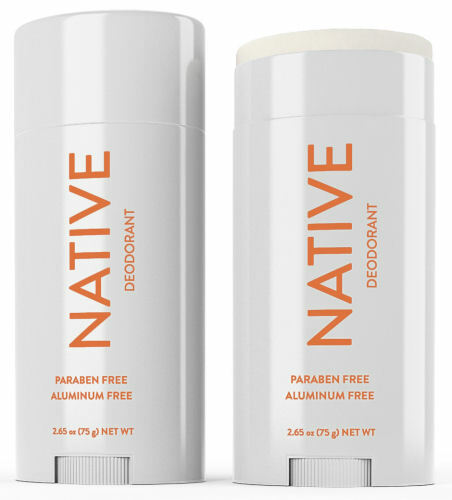 OZNaturals has created a fabulous line without the heat or petrochemicals. The Cold Pressing process works at room temperature which then allows the ingredients to remain fresh and highly potent as intended. Until now, skincare companies had no way of preserving their products naturally without degrading the active ingredients. What is also great is that Cold Processing is environmentally friendly and uses less energy and carbon dioxide. Also, all OZNatural products are cruelty free, gluten free, and vegan. There are no parabens, GMO’s, sulfates, phthalates, synthetic fragrances, synthetic color, petrochemicals, propylene glycol, PEG’s or formaldehyde. Three powerful products from this excellent company are the Vitamin C Facial Serum, Vitamin C + Sea Hydration Mask, and the Super Youth Retinol Facial Moisturizer. Formulated with Rose Hips Extract, Hyaluronic Acid, Astaxanthin, and Vitamin C20, with this serum you will have smoother skin texture, brighter complexion, and a youthful glow. This antioxidant formula lifts and firms while helping to nourish the skin allowing it to heal naturally. Blended with Giant Sea Kelp Extract, Spirulina Extract, Hyaluronic Acid, Vitamin B5 and Vitamin C, your skintone will brighten, pore size will be reduced, and your face will be nourished and hydrated. 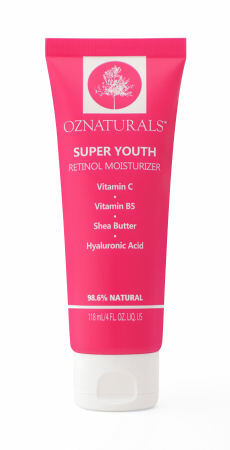 The hyaluronic acid and Vitamin B5 improve the look of exhausted parched skin. The enclosure of antioxidants such as Vitamin C also make it ideal to use on sundamaged skin, to rejuvenate and improve hyperpigmentation. 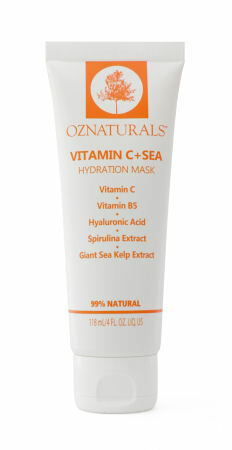 As soon as you put the mask on you feel its potent ingredients working immediately. Not only does the mask deliver anti-aging benefits and deeply hydrate the skin but it is gentle enough for everyday use! Made with Hyaluronic Acid, Shea Butter, Vitamin 5, and Vitamin C, not only does your skintone improve but you can expect powerful anti-aging results and the appearance of fine lines decreases. The rich formulation in this product contains retinol which helps to get rid of that dull, dead skin and heighten the process of cell turnover. The skin will look younger and brighter. It is beneficial to use a moisturizer with retinol especially if you are concerned about wrinkles, pore size or dark spots. As soon as you put this product on you feel the moisturizer absorbing deeply into your skin and the result is a hydrated and well-nourished face. You know this product is working from the moment of application. The OZNaturals Collection is available online at OZNaturals.com and Amazon.com. ALLSAINTS has created three fabulous unisex fragrances in the scents Sunset Riot, Metal Wave, and Incense City. The scents are intended to for you to find a new way to express yourself! They also make for a perfect gift since they can be for a man or a woman. Sunset Riot is a mix of pink pepper, orange flower, and cedarwood, perfect for a night out. Metal Wave blends juniper berry, magnolia, and papyrus wood great for uplifting the senses. Incense City keynotes with cypress, cedarwood, and incense for a romantic and sultry scent. Find these fragrances at https://www.us.allsaints.com/eau-de-parfum/fragrances/.